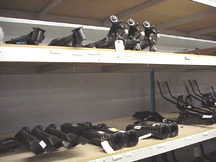 Bulk storage racks are utilized in a number of applications for automotive dealers. Bulk storage units are ideally suited for any type of hand-loaded material. It's designed for greater cube capacity than standard shelving, but lower priced than pallet rack. It can be used for storing a broad range of bulky parts or hard-to-store items. This storage solution can be integrated with mezzanines, stock rooms, and other areas where it's critical to store single, bulky parts such as tail pipes, shafts, and frames. Widths: 24", 48", 60", 72", 84" & 96"
Depths: 18", 24", 30", 32", 36", 42" & 48"
Beam Capacity: 700 - 2,200lb.